Wednesday 21st – Sunday 25th August… on the picturesque Clyde Coast opposite Arran lies Irvine…. it’s a 30 minute train journey from Glasgow. There are concerts, sessions, an open stage competition, events in schools, community concerts and not forgetting two World Championships – the amazing Whammy-Diddling and the even more amazing Chuckie-Chucking. Umpteen good reasons therefore to come to Irvine in the third week in August…..and we haven’t even mentioned the other attractions happening in the town at that time – a Horse-Drawn Parade, Fireworks Display, Flower Show, local Football Derby, 10K Road Race, Heritage Tours……..
Irvine in August – come and join us! World Championship titles go to Stavanger and Saltcoats! 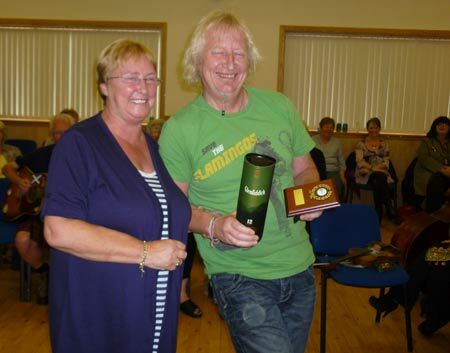 It was two musicians Eivind Hodne from Stavangerand Stephen Quigg from Saltcoats who won the World Whammy-Diddling and World Chuckie-Chucking respectively on the final day of the 45th Marymass Folk Festival. The World Championships came at the end of what had been an excellent Marymass Folk Festival. Packed sessions at The Ship with musicians and punters in nearly every corner, a tremendous final concert on Marymass Saturday in the Volunteer Rooms held together in fine style by Bill Nolan and many other highlights made it a memorable 45th Marymass Folk Festival. 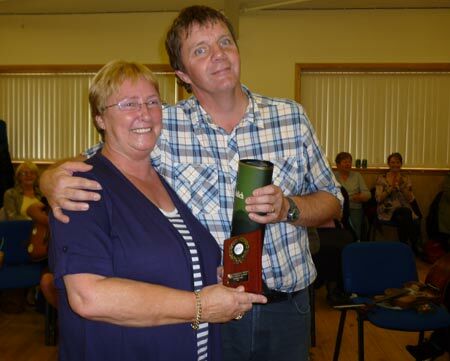 The much-sought trophies and even more sought after bottles of Glenfiddich, were presented to Eivind and Stephen by Marymass Folk Festival’s Joyce Hodge. Musicians and Whammy-Diddlers this way please! The annual Marymass Festival in Irvine is now well underway and as an integral and popular part of the town’s celebrations, the 45th Marymass Folk Festival swings into action on Wednesday 22nd August for a five day musical thrash. It starts on Wednesday afternoon in gentle fashion with Coffee Afternoon Folk climaxing on the Saturday night the 25th with the fabulous new band The Outside Track. Among the 20 folk music events on offer there are lunchtime folk sessions at The Ship Inn at the Harbourside, mini-concerts in five local schools, and an afternoon concert especially for senior citizens. Marymass Queen Elect Emma Morrison will formally open the 45th Marymass Folk Bonanza on Wednesday night at Vineburgh Community Centre in Quarry Road followed by the Open Stage Competition. On Thursday, Friday and Saturday evenings there are concerts featuring artists with one common denominator – they are all quality musicians and singers who excel at entertaining audiences. Artists this year include Celine Donoghue & Neil Sturgeon, Stephen Quigg, Tom McConville & David Newey, The Barbara Dymock Band and Heather Heywood. International representatives are Irish band Drantan, The Stavanger Harbour Band and from Ireland, England and Scotland- The Outside Track. All this plus not one but two world championships to be contested! The tricky Whammy -Diddling and the baffling Chuckie-Chucking. Both championships will be played to a finish on Sunday 26th August at Vineburgh Community Centre and participants are quite possibly already limbering up so that they are in peak condition. What’s involved? Go along on Sunday at 2pm and find out! Programmes are now out for the 45th Marymass Folk Festival which runs from Wednesday 22nd to Sunday 26th August. You can pick one up at any North Ayrshire Library, the HAC inIrvine, Museums, The Magnum and many places in the South West too. Or, if you can’t find one, phone Joyce on 01294 551047. Festival guests: The Barbara Dymock Band, Celine Donoghue & Neil Sturgeon, Drantan, Tom McConville Duo, Stephen Quigg and The Stavanger Harbour Band will be playing at various times during the Festival. Marymass Folk Festival at School! With Festival Guests and Friends. Includes the amazing World Whammy-Diddling Championship and the difficult-to-follow World Chuckie-Chucking Championship. MCs at the festival will be Dominic Boyce, Bill Nolan and Willie Sinclair. B.Y.O.B. Please note, Wednesday, Thursday and Friday nights are BYOB. It was with great sadness that news was received of the death of Darach de Brun of Irish band Drantan. 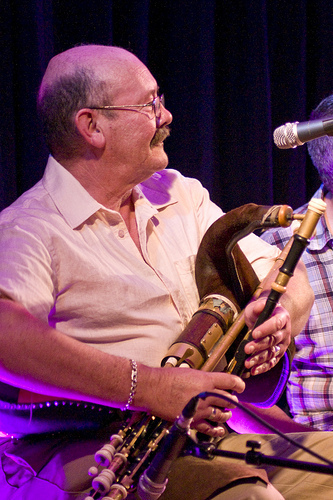 Darach died suddenly on Sunday 24th June inDublindoing what he loved – playing the uilleann pipes. Darach had played at Marymass in the dim and distant past and because of the good memories he had, he wanted his band Drantan to experience Marymass. And so it was that in 2009 Drantan first played at Marymass Folk Festival. The quartet quickly became firm favourites withIrvineaudiences and have played at the annual festival since. Whilst he made his living as a bookbinder, Darach was happiest playing his pipes and loved being part of a session or simply listening to new bands. Darach enjoyed playing in Irvine pubs, at concerts, schools – anywhere in fact as long as he could bring music to people of whatever age. He was an outgoing man, interested in so many things and made friends easily. The ‘Landladies and Landlords’ who housed Drantan when they were in Irvine always spoke warmly of Darach – he was an easy guest. Darach is survived by his wife Val and their two sons. The sympathy of Marymass Folk Festival and Irvine Folk Club goes to Darach’s family and Drantan band members Liam Davis Snr, Gerry Byrne and Liam Davis Jnr. 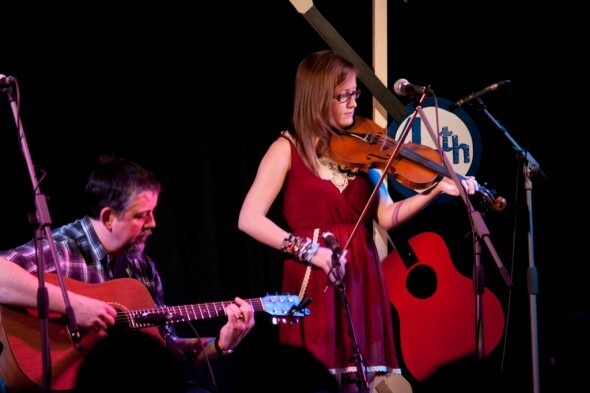 NEWS: Lottery funded Marymass Folk Festival Fringe! The new Marymass Folk Festival Fringe proved to be an excellent warm-up to the 44th Marymass Folk Festival with guests including John Carmichael & His Band; Dominic Boyce & Ian; Haggerdash; Landermason; Lyra Celtica; Maw, Paw & The Wean; The Tattie Howkers Ceilidh Band; Thomas Turner and Michael Woods. The Folk Festival Fringe was made possible by an Awards For All grant and it means that folk musicians can be heard by people who otherwise might not have the opportunity. In the early days of the Folk Festival, musicians playing in the street were commonplace. Rising transport costs and a move away from live music contributed to the demise of such outdoor sessions. Experience here and elsewhere shows that there is a demand for live music and having it outdoors helps make an overall feel-good factor in the community – particularly when the town is geared up for its annual Marymass Celebrations. The funding also supported a Marymass Photography Project. Essentially, it’s about asking anyone who has a camera to take photos at Marymass and these will then become a Marymass Web Exhibition later in the year. The web based exhibition will hopefully have some of the pics that will be seen in future years. The general concensus is that 2011 was a Vintage Year for the Marymass Festival. Photos and a report will be added to the site over the coming weeks. Vin Garbutt, a late addition to Marymass, headlined the Friday evening concert in the Volunteer Rooms and live up to his reputation as one of the funniest people you will ever meet. The new Marymass Folk Festival Fringe proved to be an excellent warm-up to the 44th Marymass Folk Festival with guests including John Carmichael & His Band; Dominic Boyce & Ian; Haggerdash; Landermason; Lyra Celtica; Maw, Paw & The Wean; The Tattie Howkers Ceilidh Band; Thomas Turner and Michael Woods. The Folk Festival Fringe was made possible by an Awards For All grant and it means that folk musicians can be heard by people who otherwise might not have the opportunity. Marymass Through the Lens – is a project recording this year’s Marymass Celebrations in photographs leading to a web based exhibition. Several photographers took part and the photographs will be made available over the coming weeks and months. If you took photographs at Marymass but were not part of the official project, is it not too late to get involved. Your photographs can be selected for the exhibition and we can start planning early for next year’s festival. 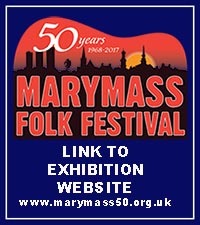 To get involved with Marymass Through the Lens, phone Joyce of Marymass Folk Festival on 01294 551047 or email her at JoyceIFC@aol.com. As with the Folk Festival Fringe, Marymass Through the Lens has been made possible with support of an Awards for All grant. To see what you missed, have a look at the programme – but start looking forward for the 45th Marymass in 2012!! Nineteen scheduled events made up the 2011 Marymass Folk Festival. The Folk Festival Committee arranged a strong and varied line-up. The Buskers from Dublin made their annual pilgrimage to Marymass as did Johnny Silvo. Johnny along with Stephen Quigg, Heather Heywood and Arthur Johnstone were all on stage for the Singers’ Concert on the Thursday night. 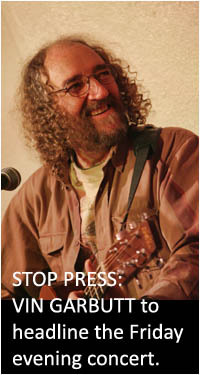 Vin Garbutt topped the bill on Friday night along with the residents. The Marymass Saturday Night concert featured all the resident artists who were all over Irvine throughout the Festival. Taking part was the aforementioned Buskers and Johnny Silvo, the four-piece Drantan who are now firm Marymass favourites, Perthshire native Doris Rougvie, Lurach – an exciting four-piece acoustic band, Stephen Leeson – a young man from Dublin with a fine voice and easy style….and The Past Masters – a flexible line-up of some of the more ‘mature’ performers on the folk scene! WEDNESDAY 17th August: The Welcome Folk Coffee Afternoon Mure Church Hall, West Road, 1pm-3pm £1.50. Formal Opening of the 44th Marymass Folk Festival The Marymass Queen Elect will open the Festival followed by The Open Stage Competition. THURSDAY 18th August: The Thursday Lunchtime Session with Festival Guests. Concert for Senior Citizens Sponsored by Irvine Rotary Club, with Festival Guests. Singers’ Concert, with Johnny Silvo, Heather Heywood, Arthur Johnston & Stephen Quigg plus Festival Guests.The After Concert Singaround. FRIDAY 18th August: Marymass Folk Festival at School with Festival Guests, Sponsored by Irvine Rotary Club. The Friday Lunchtime Session – With Festival Guests. Bridgegate Folk – Dranntan. Folk Music at Options for Independence, with Festival Guests, Sponsored by Irvine Rotary Club. The Danny Kyle Tea-Time Session with Festival Guests and Friends. FRIDAY NIGHT CONCERT: Vin Garbutt plus Festival Guests. The After Concert Singaround. SUNDAY 21st August: The Marymass Survivors’ Session with Festival Guests and Friends. Includes the amazing World Whammy-Diddling Championship and the mind-boggling World Chuckie-Chucking Championship.